Young females usually occupy the same range as their mother although ALL females are solitary except when they have a litter. Average female home ranges extend to 833 square kilometers (322 square miles). A female raises her cubs alone since adult male and female cheetahs mix only to mate. The average life span of wild radio-collared female cheetahs is 6.9 years which compares to 11.7 years for females in captivity. 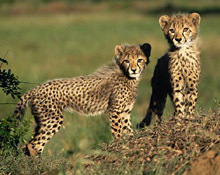 Cheetah gestation periods (pregnancy) lasts about 93 days and a litter may contain 2 to 8 cubs. At birth cubs are about 11.8 inches (30 centimeters) long and weigh 0.6 pounds (250-300 grams). Although they are blind and helpless at birth, they develop rapidly. Their eyes open at 4 - 10 days and at 3 weeks their teeth erupt. Their fur is gray in color with a longer mantle of hair along the back. This mane-like growth, which possibly helps camouflage the cub in grass, begins to disappear at 3 months but may still be seen even at 2 years of age. Only a few cubs reach adulthood: lions and hyenas are their greatest threat. During their first few weeks of life the mother moves her cubs every few days to avoid these and other predators. However, being a single mom, she must leave them alone to hunt and consequently mortality is very high, possibly 90%, during this period. Cubs surviving to 5 months of age are able to outrun almost any other adult carnivore - except, of course, another cheetah! Juveniles stay with the mother for about a year and following this period the litter members live together for a time perfecting their hunting skills. At around 23 months of age the female reaches sexual maturity and she either leaves her brothers or they are separated from her by older dominant males. Site Sponsor: Adams Jewelers, Inc.